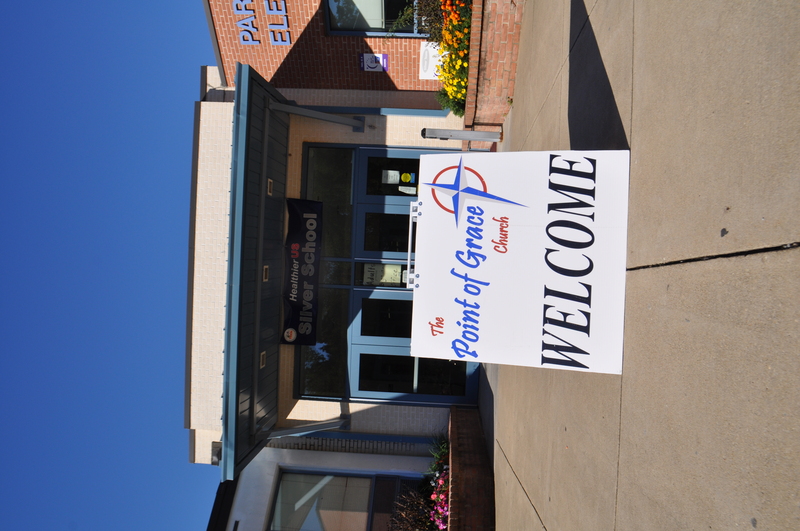 A portable sign welcomes church visitors to Park Hall School on a Sunday morning. Arthur Shepherd has lived in St. Mary’s County, Md., for all of his life, in close proximity to the community of Park Hall. Drive with him down the busy four-lane highway and he’ll show you the corner where he grew up when it was still a lazy, two-lane country road. If his enthusiasm to begin a Bible-teaching congregation sounds like that of a coach or a teacher, it might because he spent a career working for the St. Mary’s County Recreation and Parks. He retired as Recreation Division Manager in 2011 after 33 years with the organization. 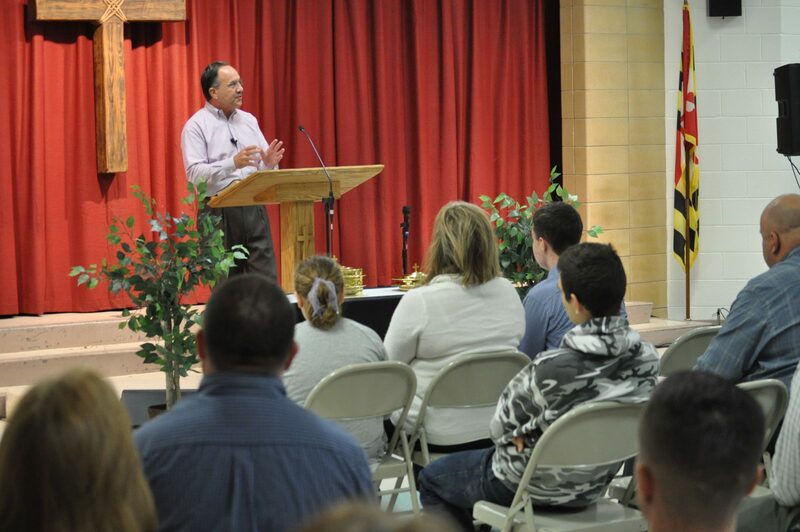 “We want to be a place where lives are changed,” noted the pastor, who planted Point of Grace Church in 2012. (It currently meets at Park Hall Elementary School.) It was accepted into the Fellowship of Grace Brethren Churches during national conference last year in Atlanta, Ga. The group has taken advantage of their school location (and his parks and recreation experience) to provide programming for students, including hosting a series of free sports clinics. 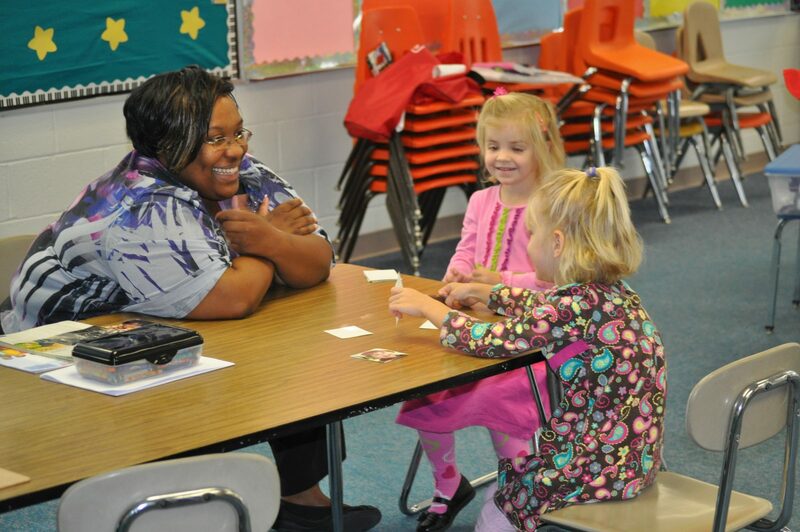 Children receive personalized attention at Point of Grace Church. If the number of children who crowd the school halls before and after services is any indication, the church is meeting that goal. “My girls get up on Sunday morning and can’t wait to go to church,” said Michael Knight, an aerospace engineer who with his wife, Angie, had been looking for a place to worship with their seven children. “From the moment we walked through the doors here, it was like walking into an old family gathering,” he added. Christy Henderson tried the church after seeing an ad on the local cable television channel. Four weeks later, her adult children and grandchildren have followed her to the church. “They love it and intend to keep on coming,” she said. Sarah Williams and her husband, Jason, both Army veterans who served in Iraq, also found a spiritual home for themselves. “Every time [Pastor Arthur] has a sermon, it feels like he’s talking directly to me,” she noted. 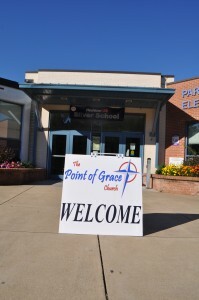 Pastor Arthur Shepherd wants to reach his community for Christ through Point of Grace Church, Park Hall, Md. Shepherd and his leadership team are missionally minded, with six neighborhoods near Park Hall School in their sights. One of them is St. Mary’s College, a public liberal arts college located four miles to the south. Shepherd has met with the leadership of the Christian student groups on campus, inviting them to attend Point of Grace and become involved. Grace Chapel of Southern Maryland, located 25 miles north, is their sponsoring church. “They didn’t stand in the way of the gospel,” stressed Shepherd. They provided financial support and offered the use of the church facilities for events such as baptisms, while offering encouragement and prayer. They also provided members who went with Shepherd to plant the church. The result has been a vigorous start to a new ministry. “God sent a strong leadership team to begin this mission,” said Shepherd.